Sound ID has taken the lid off their new HD300 Bluetooth headset featuring proprietary NoiseNavigation technology that promises "pristine sound" by isolating speech and automatically reducing wind and background noise using dual microphones and DSP algorithms. A lot of companies make similar claims, but Sound ID's word is backed with the nerdy credibility of a staff composed of "hearing specialists and top acoustic scientists." We shall see if they live up to the hype when the HD300 is released in Q3 of 2008 for $119.99. Full details are available in the press release after the break. Sound ID Announces Latest Bluetooth Headset Innovation - the HD300 Developed by acoustic scientists and engineers, the Sound ID HD300 offers exceptional Bluetooth connectivity, sound clarity and comfort Las Vegas, NV (CTIA) and PALO ALTO, CA, April 1, 2008 - Sound ID, the leader in personalized sound, today announced a breakthrough Bluetooth headset, the HD300. With NoiseNavigation™, providing pristine sound through the automatic reduction of wind and background noise, the HD300's acoustic innovations are evenly matched by its narrow form and chic, high-gloss piano black finish. "Comprised of hearing specialists and top acoustic scientists, Sound ID brings an in-depth knowledge of the human ear to the Bluetooth arena," said Michael Jones, President and CEO of Sound ID. "Engineered to complement the natural hearing process, the HD300 delivers great audio and a slim design for comfort and style - ensuring its place among the slickest gadgets on the market today." The Sound ID HD300 Bluetooth Headset offers several unique technology features, including: · NoiseNavigation - A proprietary development, NoiseNavigation optimizes speech intelligibility at both ends of the conversation, as dual microphones isolate speech and DSP algorithms automatically reduce wind and background nose. · PersonalSound™ - HD300 users can choose from three listening modes - tuned to the most common hearing preferences - further enhancing speech clarity without raising the volume. · Automatic Volume Control - This feature eliminates the need for constant volume adjustment in variable noise situations such as driving. Created for extended wear, the lightweight HD300 includes scientifically designed RealComfort™ EarLoops. Available in three sizes, the EarLoops provide a secure and comfortable fit and are engineered to better channel sound into the ear for enhanced listening. Users will also appreciate the headset's compatibility with standard micro USB chargers, which come with many of today's popular mobile phones and may eliminate the need to carry multiple chargers. Sound ID has also created a free downloadable application that extends the HD300's functionality and enables users to control the headset via their mobile phone. The application includes a sound level meter to monitor surrounding noise levels, volume control and a battery life indicator, among other features. HD300 Specifications · Weight: 8 grams (0.28 ounces) · Dimensions: 53.5 x 15.5 x 7.5 millimeters (2.1 x 0.6 x 0.3 inches) · Battery Life: Up to 6 hours talk time, 200 hours (8 days) standby · Latest Bluetooth Technology: Bluetooth version 2.1+EDR with eSCO improves the transmission sound quality and is compatible with earlier versions of Bluetooth. Pricing and Availability The Sound ID HD300 is expected to be available in Q3 2008 for $119.99. 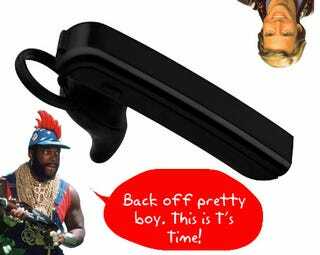 It will come with a Universal AC charger (100-240 VAC), three sizes of RealComfort EarLoops and an Ear Hook for an alternative over-the-ear wearing option.